The physical change from childhood into adulthood occurs due to an increase in the hormone oestrogen in girls and testosterone in boys, which usually occurs between the ages of 8 and 12 years in girls and 9 to 14 years in boys. Problems can develop if puberty occurs early (‘precocious’) or late (‘delayed’). Early or ‘precocious’ puberty is when the physical changes of puberty start too early. 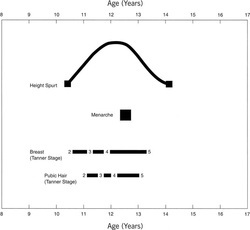 In both girls and boys, early puberty will be accompanied by both a growth spurt and emotional maturation. Whilst the growth spurt will result in your child being taller than their friends, which they may see as a benefit, eventually they will stop growing sooner and may actually end up short as an adult. Early emotional maturation may mean that your child gets treated in a manner not appropriate for their age. Sometimes treatment may be required to switch off the puberty hormones. It is important to tell the difference between ‘true’ early puberty and other milder conditions not requiring any treatment. This may require lengthy follow-up or repeat testing of the hormones involved. As treatment can be for a number of years and as the injections are painful, it is important that these assessments be undertaken by a specialist. For teenagers, delayed puberty can be upsetting because they will look less physically mature than their friends, and they be less emotionally mature than their peers. If there are no signs of puberty by around age 12 in girls or 14 in boys, then they should be assessed by a specialist. The majority of cases are due to “constitutional delay in growth and puberty”, which can run in families and is treated by giving testosterone to boys and oestrogen to girls to ‘kick start’ puberty. The problem can sometimes be due to the brain or the ovaries or testes not working properly which requires more detailed testing and treatment.